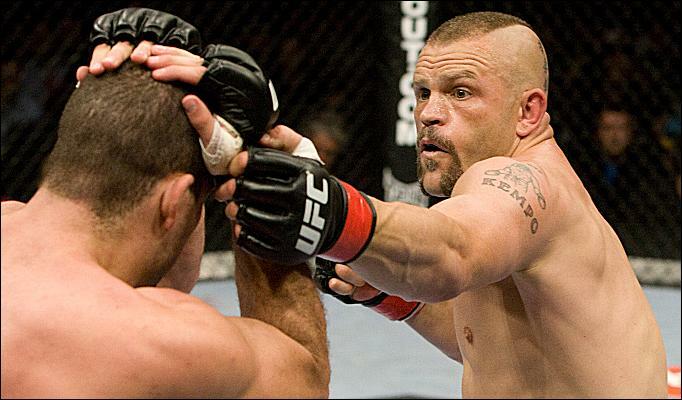 Rich Franklin crumbles Chuck Liddell with a short right hand in UFC 115 main event (Pic). Is this the last image we see of the “Iceman” inside the Octagon? Perhaps more important, should it be? 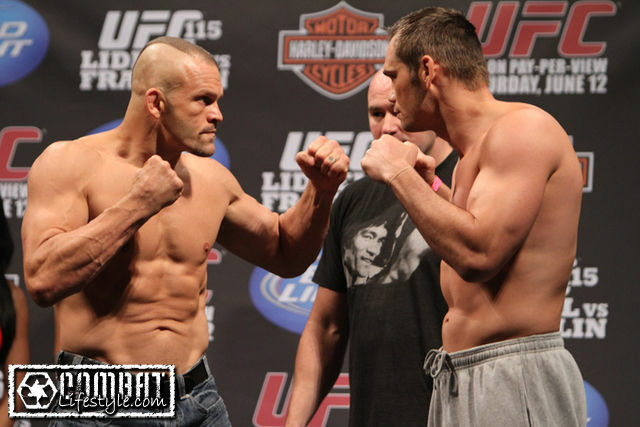 For complete weigh in results for UFC 115: “Liddell vs. Franklin” click here. Pat Barry gets hyped after the jump. Sound familiar? Well, that’s because it is. But, Mr. White wants everyone to know that he isn’t bluffing this time around. 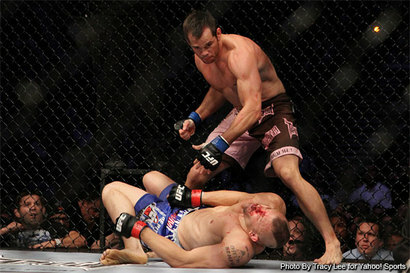 If Liddell loses this weekend at UFC 115 against Rich Franklin, that’s a wrap. Dana points to the difference in “The Iceman’s” approach the game for this fight as opposed to others in the past as the reason a defeat here, when Chuck’s in the best possible shape he can be, would mark the end of his illustrious career. I think. I’m pretty sure. Maybe not. So, what say you? 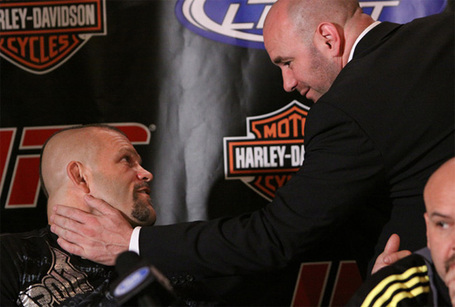 If Liddell goes down this Saturday night, does he live to fight again? Or, is Dana for real this time? Will he demand the end of one of the greatest MMA careers of all time? What are your thoughts? Former UFC light heavyweight champion Chuck Liddell talks to the media at yesterday’s conference call (via Sherdog.com) and expects opponent and ex-middleweight champion Rich Franklin to present a bigger challenge than original foe Tito Ortiz. “The Iceman” has some pretty lofty goals for the remainder of 2010, including another run at the 205-pound title. Will “Ace” make sure he never gets there? And if he does, what happens against guys like Rampage, Evans and Rua, who already own (T)KO losses over the TUF 11 coach? Just as Quinton “Rampage” Jackson did for UFC 114, Chuck Liddell will be coming into his main event bout against Rich Franklin at UFC 115 following a 14-month layoff. Not exactly ideal for the 40-year old former UFC light heavyweight kingpin. “The Iceman” however, says he isn’t worried about the affects of ring rust. Even though “Rampage” admitted his time off from the fight game played a role in losing to Rashad Evans last weekend, Chuck points to the fact that he started his training camp for this fight in much better shape that Jackson did for his. Can’t really argue with that point. So, what do we think? Will Liddell’s long layoff prove to be the difference maker in this match up? And is Chuck’s prediction of a knockout in his favor in line with what you’re thinking? Let’s hear some thoughts.